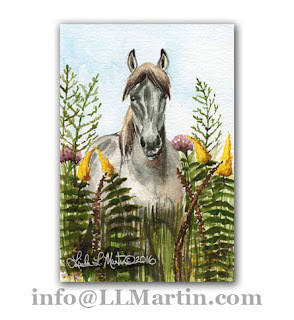 Virginia Wild Flowers Series of Small Format Watercolors includes special horses, wild life and some wayward domestics. For the September wildflower series this year I decided to go back to my roots. These studies and small format works might actually bring me back to some serious paintings like those from my days on the mountain. I (and my assistant and her little dog) traveled to The Phelps Wildlife Management Area. I am so fortunate to have it so close by. Seriously, I would love to be out west close to the ranges of the wild horses. But here in Virginia this is right in my back yard ... well down the road about 5 min. And people ride their horses, fish, hunt and even walk their dogs there. Local photographers have a wonderful time with the manged wild flowers that are nurtured to attract birds and wildlife. 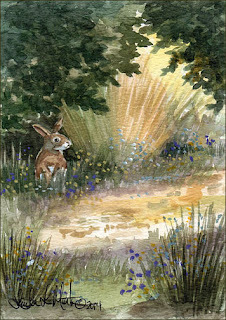 Today's paintings is a sample of that little series. 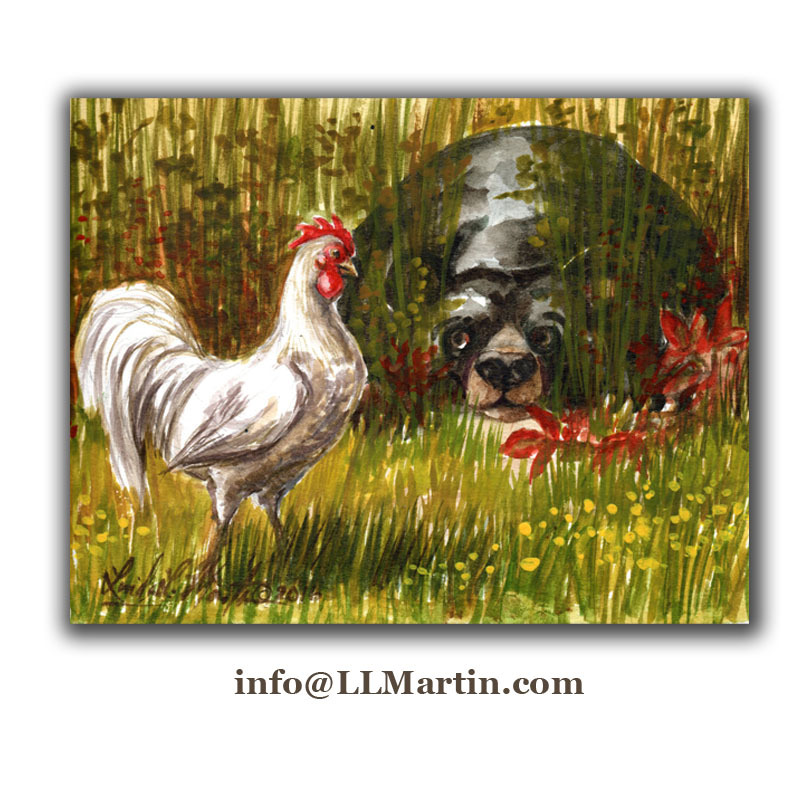 Most of which are on Etsy at my Every Day Art Shop at: LindaLMartinArtist.etsy.com And there are more to come. You can search "CAST" and "AWETeam" to see more participating artists in the Etsy Handmade search. Sometime after my mother died in 2012 my sisters witnessed the first bear on the mountain where they live since the 1960s. Development, logging and hunting had just about wiped them out. The closest thing we came to spotting one was a Newfoundland dog, who surprisingly has the exact same shine to its black coat as a very healthy black bear and looks at a distance about the same size. In the last three years bear populations have been increasing like crazy in urban areas. People like green spaces and even though areas like Alexandria, Virginia and Fairfax County have been fully developed for years, the bears, deer and even beavers have made a comeback in the green spaces. Of course that causes traffic issues and endangers both the animals and the people. So authorities periodically have hunts to relocate troublesome bears to the mountains of Virginia. The thinking is that they will not be able to return to their former home. Trouble is the relocation is also causing problems. Bears need space. Bears need a food source. And putting a bear in the wild after it has learned to eat at McDonald's is about the same as putting a person out in the wild to learn to eat garden grown foods, drink fresh water etc. The bears have developed a taste for the good life and they bring that habit with them to the country and the parks. Thus there seems to be a growing abundance of black bears who not only have no fear of humans, love McDonald's french fries.. but they also have a taste for bird seed and seed feed for livestock. Thus the problem. And thus the inspiration for the little watercolor series I am doing of relocated bears. The anecdotes that inspired the series are from my friend. She and her husband have property bordering Passage Creek. Passage creek is a main tributary of the North Fork of the Shenandoah River. My best guess is the bears over crowding in The George Washington National Forrest is driving the bears to follow the creek out of the Forrest and into farmed and rural developments to find new food and territories. However, please do not copy or download.Thank-you. Yardley hops carefully from her favorite sleeping spot. The air is crisp and clear. It is too warm for frost yet. She knows that it will be very hot in the afternoon. The sun is just peaking over the privacy fence near her favorite hiding spot. She sleeps beneath the boxwood bush. It's lowest branches brush the earth and makes a nice place, protected from marauding creatures of the night. It is now tangled with bright yellow grape vines. Some bird thought it would be a nice joke to plant in the yard. Yardley is a town rabbit. She is wild; make no mistake about that. But Yardley has learned to adapt to the people who live in the small town. She really knows no other way of life. Yardley is waiting for her friend. A small poodle named Jay. He pretends to bark and growl like he is protecting his home. Yardley knows he is just lonely so she doesn’t run when he comes. She simply sits like a furry bunny statue until he calms down or another animal such as one of the very nervous Nutz Family (they are squirrels) appears to tease him. That sets Jay off again. This morning Yardley is very quiet and patient. Her friend will be here soon. In the meantime there is a nice breakfast of white clover and tiny lawn flowers to keep her busy. 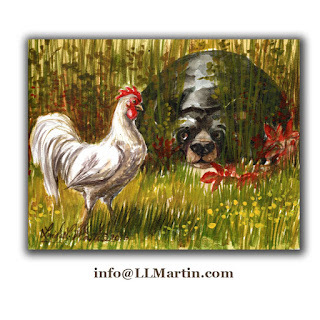 LindaLMartin© 2016 All North And South American, World And Electronic Rights Reserved. 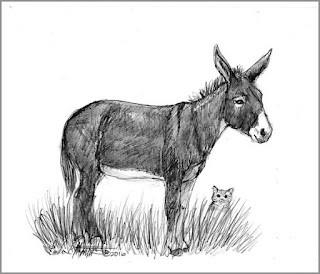 "Well, Donkeys like to have friends, too, I guess", Patience stated. Her long ears seeming heavy in the humid air. " We like to play too" She added " But not on days like this." The air was thick and for lessor animals it was hard to breath. The sun was blazing in the southern heat. Patience took a step and then stopped.
" Even the mice in the tall grass didn't seem to want to move out of the way because it is so hot." she said. Vic's cat ears just perked right up at the word 'mice'.
" I think we could have a really good friendship," Vick insisted. " 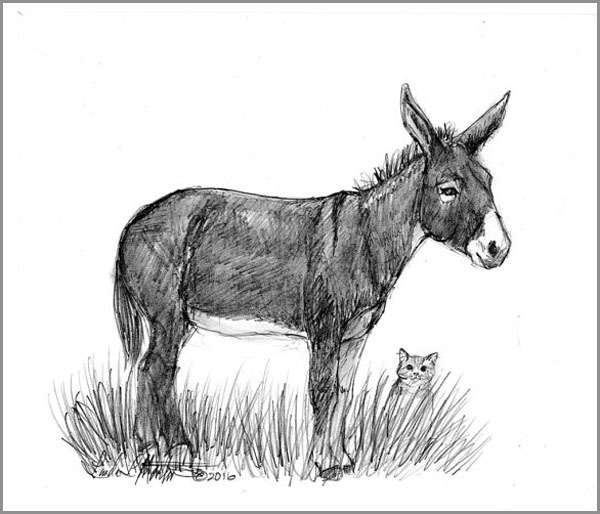 You could stir up the mice for me as you graze and I could clean your ears for you and scratch your itches in the evening." Patience rather like the idea of an good itch scratch at the end of the day. " You wouldn't use your claws would you?" "Well not on purpose. But if you had a particularly bad itch, I would be glad to bring them out. Gently of course." Vick insisted.
" That would be alright too" Patience agreed. " I think we can be friends." "Me too! "Vic purred. "And I must say you do make a very good shade when there are no trees around." "Oh thank you, Vic, I do. And I am happy to do so." Patience snorted happily. " It is nice to have you as a friend. And the two of them wandered off to find a cool shady spot until evening. LindaLMartin© 2016. Simple theme. Powered by Blogger.